India is the second most populated country in the world after China. This can be both a boon and a curse. These two countries are seeing massive migration to their main urban cities. Coming closer to Nagaland, the trend is similar, with many leaving the villages and preferring to stay in the towns due to better facilities, educational needs and better infrastructure. To reverse or slow down this trend, we need to focus on the rural areas and bring development to them and not bring them to development. According to the 2011 census, out of Nagaland’s 19.81 lakh population, 71.03% i.e. approximately 14.07 lakh people, live in its 1317 villages. Approximately, 4.59 lakh population residing in rural Nagaland, even after 65 years of independence, do not have even the basic amenities of electricity, road, water, communication, education, sanitation and health. This is despite the fact that the government spends crores on rural development. Clearly, resource allocation is not the problem, but proper implementation seems to be the primary reason. The government system of disbursal of funds and implementation of projects needs to be monitored properly. A complete overhaul in system and thinking is required. However, it should not be the sole responsibility of the ministry of rural development but as citizens of this state, we must also take up the responsibility wholeheartedly. A lone ministry is not enough to ensure rural development but it should be the mission of the entire state. 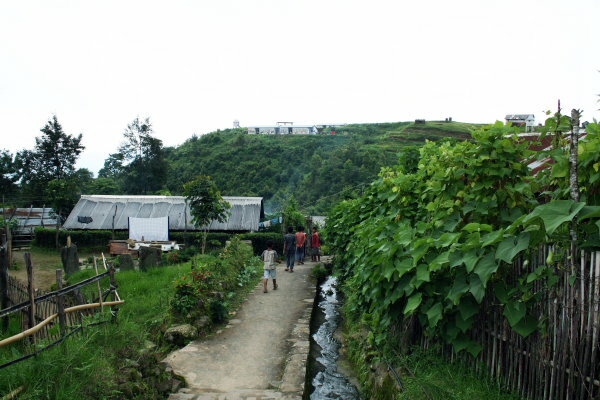 The development of Nagaland depends upon the development of villages in Nagaland. So what are the primary motivating factors for the development of rural Nagaland? Availability of basic services like electricity, road, water and communication in every village would help initiate one of the largest grassroot capitalist movements, allowing more people to participate in commerce and trade. Firstly, regarding electricity, an example that might be worth duplicating is Tengging village in Arunachal Pradesh, which was electrified with two 10 kw wind systems in 1988. Due to the ragged terrain in the area, it was doubtful that grid power could be brought to Tengging. The largest decentralised rural electrification project in the world is based on wind generators. In China over one lakh locally produced 10 mw wind turbines have been installed in Inner Mongolia in the last seven years. Secondly, for safe roads my recommendation would be that the construction and maintenance of roads and drainage system should be entrusted to a dedicated agency and specific tasks outsourced, if necessary, to ensure quality and efficiency. The current scenario is one in which one agency constructs the road, while another is responsible for ensuring that the corresponding drainage alongside is in proper condition. This lack of coordination results in blockage of drains each time the road gets a fresh coat of tar. Ideally, there should be just one body looking at both aspects. Thirdly, water continues to be a scarce commodity. I still remember the days while I was pursuing my Post Graduation while residing staying at a rented house at ‘D’ Block, Kohima where sometimes my roommate and I had to walk deep down to the valley to collect water at night, along with other neighbours. Although a lot of commendable work is going on, yet greater emphasis needs to be placed on the following areas by adopting a watershed, management etc. Industrial economic activity which is highly concentrated in urban areas should be encouraged to spread to rural areas as well. Similar to the Chinese model, setting up a factory or an industry in rural areas might help to improve the economy and combat unemployment and low productivity problems, along with the added bonus of lower prices of land, labour and perhaps even raw material. Each ministry should have a vision and mission statement and measurable targets. After five years, the targets should be measured and made transparent to the public. The focus of the ministries should be towards execution of these vision and mission statements, and achievement of the interim targets. The purpose of this is so that although elections may take place, ministers may change, the vision and mission statement and interim targets stay on track. For the State’s sake, it is my hope that the residents of this state stand united and political parties put aside their differences so that there can evolve a ‘common minimum programme’ under the government’s rule and functioning, all in order that one day we will witness the Nagaland of our dreams!